Alfa Romeo was Europe's fastest growing brand because of strong demand for models such as the Giulia (shown) and Stelvio SUV. Europe's first-half vehicle sales rose by 4.6 percent, defying predictions that the market would be nearly flat, and pushing monthly volumes to the highest level since June 2007, the pre-recession high point. Every auto group except General Motors showed gains in year-over-year sales in the first six months. There are signs, however, that the European rebound that started in 2013 may be losing steam, including a 1.3 percent contraction in the UK, Europe's second-largest market after Germany, which also trailed the average with 3.1 percent growth in the half. Elsewhere in Europe's five largest markets, Italy gained 8.9 percent and edged into third place by vehicle sales ahead of France, which rose 3 percent. Fifth-place Spain increased by 7.1 percent. But the real winners were the newer members of the European Union: Romania surged 27 percent, Croatia 24 percent, Lithuania 20 percent and Bulgaria 19 percent. First-half sales were bolstered by solid macroeconomic fundamentals, according to the European Central Bank. Rising economic confidence, low interest rates and falling unemployment are expected to support domestic consumer demand, the ECB said in an optimistic forecast in late June. "The economic recovery in the euro area is projected to continue, at a faster pace than previously expected," the bank said, with GDP expected to grow at around 1.8 percent a year through 2019. "Automakers have rarely (if ever) had it so good in the region," Exane BNP Paribas said in a June report in which it revised its 2017 sales forecast to 3.6 percent growth from 0.9 percent. Britain remains the big question mark, analysts said. The OECD expects GDP to slow to 1.6 percent this year in the UK, and 1 percent in 2018, noting in a June report: "The major risk for the economy is the uncertainty surrounding the exit process from the European Union." However, last year's fears that Brexit would weigh heavily on auto sales have not yet materialized on a large scale. "Inside and outside of the UK, there hasn't been that sort of end-of-the-world calamity we were talking about in June 2016," said Ian Fletcher, principal analyst at IHS Markit. In the next year "we will start to see what the lawmakers and the governments are going to agree to on the terms of Brexit, and customers will start making decisions based on that," he said. IHS Automotive is forecasting passenger car sales to rise 2 percent by the end of the year, "which would be a little bit down on where it is at the moment," Fletcher said. "The second half of last year was strong, so you're already on top of a higher base of comparison. That’s one of the reasons we think it will tail off." LMC Automotive is projecting annual growth at 2.9 percent. "The overall picture remains one of regional year-on-year growth continuing, albeit at a slower pace in the second half of the year," it said. Evercore ISI forecasts 2017 sales to be up 1.5 percent in Europe, with a notable decline of 8 percent in the UK. Exane BNP also struck a cautionary note, especially on the UK market. "This may be the last upgrade of this EU cycle," it said. "With confidence and employment both close to peak levels, we wonder if the next surprise is not a negative one." There were an additional 369,249 passenger car registrations through June, for a total of 8,461,476. 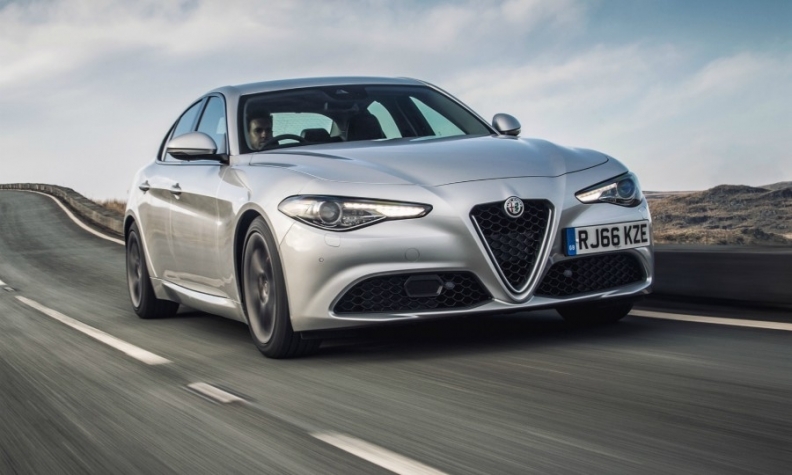 Demand continued to be especially strong in Italy, which accounted for about 25 percent of total European growth, adding 92,943 sales, according to industry association ACEA. Of the 34 brands tracked by the association, 23 showed first-half sales growth, with 11 recording a decline. Top gainers on a percentage basis were Alfa Romeo (+40 percent), Lada (+32 percent) and Jaguar (+24 percent). 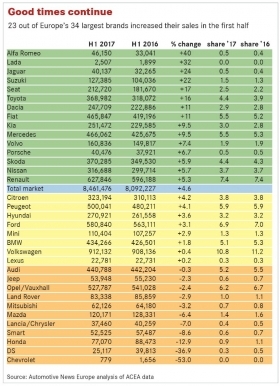 Brand winners by volume were Toyota (+50,910), Fiat (+46,651) and Mercedes-Benz (+40,387). Their combined sales growth accounted for 37 percent of the overall increase. Toyota's sales were up 16 percent, largely on the success of the C-HR subcompact crossover, a new model for the Japanese automaker. 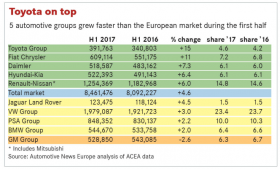 Combined with a gain of 1.3 percent at Lexus, Toyota was Europe's fastest growing group in the first half of 2017, at 15 percent. Fiat Chrysler Automobiles was second in group growth, at 11 percent, helped by surging sales of the compact Tipo and Alfa Romeo's first SUV, the Stelvio. Fiat brand's 11 percent growth helped offset a slump at Lancia/Chrysler, down 7 percent, and Jeep, which declined 2.3 percent. General Motors' European arm, Opel/Vauxhall, which is in the process of being acquired by PSA Group, was the only group to record a decline, falling 2.6 percent. A closer look at the European sales numbers for the first six months shows some interesting trends. VW Group may have found a new European sales driver in Seat, which gained 17 percent during the half on a strong rollout for the Ateca compact SUV. That offset a small drop at Audi (-0.3 percent) and a small gain at VW brand (+0.4 percent). Seat’s next SUV, the subcompact Arona, is likely to further boost sales when it is introduced later in the year. The biggest European market share gainer, by group, was Toyota, rising to 4.6 percent from 4.2 percent in the first half of 2016. Fiat Chrysler went to 7.2 percent from 6.8 percent. On the other hand, Opel slumped to 6.3 percent from 6.7 percent, and PSA was down to 10.0 percent from 10.3 percent. That will change next year, however, when Opel is fully consolidated into PSA, which will become Europe’s second-largest automaker by volume.